Charlie, a Japanese macaque, was surrendered to Palm Valley Animal Center Monday, April 30. A snow monkey being held at a local animal shelter after the exotic pet was surrendered by its owner will soon have a new home at a wildlife sanctuary. 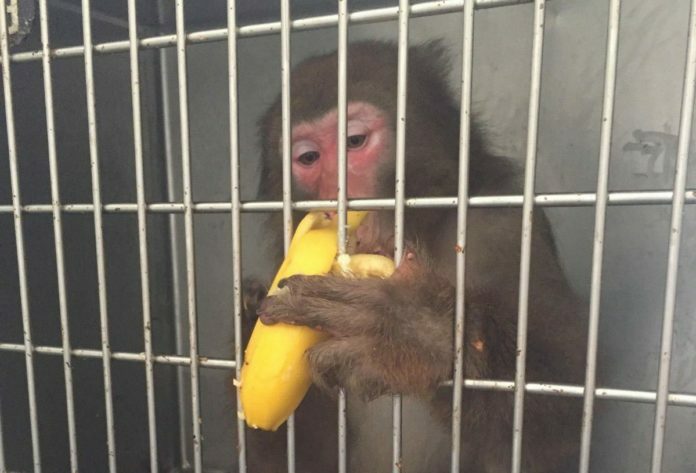 The primate, named Charlie, bit a 2-year-old boy’s finger Monday, according Deputy Jena Palacios Pacheco, Hidalgo County Sheriff’s Office spokeswoman. The boy was flown to a San Antonio hospital for treatment, and his condition is unknown at this time. Following the incident, the owner surrendered Charlie, a male Japanese macaque (a threatened species), to Hidalgo County Animal Control, which later transferred the monkey from a north Edinburg home to the Palm Valley Animal Center, where it was placed in quarantine. Wildlife Rescue & Rehabilitation, a wildlife sanctuary in Kendalia, Texas, agreed Thursday to house Charlie during the state’s mandatory 30-day quarantine at no cost to the county. Late Thursday afternoon, Hidalgo County health officials approved the decision to move Charlie to Wildlife Rescue & Rehabilitation, which will transport and care for the animal at no cost to the county. Sanctuary officials were on site Thursday. During the quarantine, Charlie will be observed for rabies and tested for further diseases. “This is yet another incident in a long and ugly history of wild animals being subjected to the horrors of wild animal ‘pet’ trade. … No wild animal should be forced to live in a cage in someone’s house and endure such an unnatural life. And there was a calamity in this case, a child was severely injured,” WRR founder and President Lynn Cuny wrote in a Facebook post. Charlie did not have any paperwork or vaccination records when he arrived and has not been diagnosed with any diseases. Rebeca Villanueva, director of development with PVAC, said she’s grateful to the county for its willingness to work with the center to find a live outcome for Charlie. In the past, PVAC has responded to at least one similar incident with a primate. Due to their lack of resources then, they made the choice to euthanize the animal. This time, they were able to negotiate with county health officials to keep the animal alive. Villanueva said Charlie is in stable condition and hasn’t been showing any negative signs. “Right now, we’re focused on just keeping his stress level down,” she said. Charlie was held in a cat kennel and fed fruit and peanuts, which he has responded well to, though he’s been leaving apple peels behind, Villanueva said. As a safety precaution, few staff members, and no media, had access to him. “To us, if an animal is eating, then they’re doing OK,” Villanueva said. In Texas, a permit is required to keep a larger primate as a pet, but permits are not required to own smaller monkeys, such as Charlie. Catie Jarl, a representative of the Humane Society of the United States, said her organization has been lobbying Texas legislators for the past three sessions to amend current pet ownership laws. “We can’t change laws, but I think the burden is on our community,” Villanueva said. Though owning exotic animals is legal in Texas, problems can arise when local entities aren’t equipped to handle such cases. Too often, the solution ends up being euthanization, Villanueva said. “Clearly, there is a market for it down here; they got Charlie from someone,” Villanueva said. “Charlie is a wild animal. He belongs in a different setting, and he would thrive in that setting a lot more. … Here at PVAC, we’re not primate experts, and that in itself poses a problem for the community. If these animals are out there and they’re in homes, we will continue to see incidents like this. Staff writer Molly Smith contributed to this report.